The Conscious Shopper attends a chocolate tasting. Several weeks ago, my local science museum hosted a special lecture by Raleigh chocolate maker Hallot Parson of Escazu Chocolates. The ad promised "sample chocolates made from several varieties of bean sourced from Costa Rica and Venezuela." No way will you ever see me turning down free chocolate, so hubby got babysitting duty and I headed off to my very first chocolate tasting. 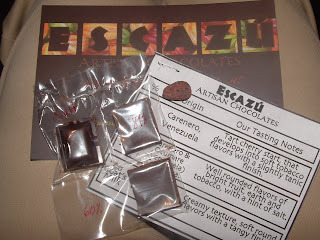 At the museum, I received a cocoa bean and three samples of Escazu's own chocolate bars. I've eaten a few Escazu chocolate bars since I moved here, so I already knew they made some delicious chocolate. But they earned a few more points on my awesomeness scale when I learned that Escazu donated all of the chocolate for this packed lecture. Parson began by describing the history of chocolate making. For the past hundred years, the chocolate industry has been dominated by a handful of very large companies. Small chocolate makers did not actually make their own chocolate - they would buy a chocolate product manufactured by another company, add their own ingredients, and mold it into a bar or candy. It has only been in the past five years or so that small artisans have started making chocolate bars from bean to bar, having a hand in every phase of the chocolate making process. Escazu's bars are also single-origin, meaning that a batch of chocolate contains cocoa beans from only one source. Why single-origin? Why bean to bar? Chocolate connoisseurs say that cocoa has a distinctive flavor depending on where it was grown, similar to wine or coffee. Escazu sources all of their cocoa beans from Venezuela and Costa Rica (Parson's company is named after the town in Costa Rica where he first decided to start a chocolate company). To demonstrate this concept, Parson had us taste each of the chocolate squares in our sample packet while he described the origin of the cocoa and the flavors each batch of bean gave to the chocolate. Start with the darkest bar (i.e. percentage of cocoa). If you start with the lightest bar, the darker bars will taste more and more bitter. Let the chocolate melt in your mouth. Why is bean-to-bar chocolate so expensive? Economy of scale. As a ginormous chocolate-manufacturer, Hershey can buy massive machines and produce everything on assembly lines. Parson showed us some of the equipment from his shop and described how difficult and expensive it was to obtain just those few machines. Some of their equipment had to be custom-made. Handmade. Because the equipment is so expensive, the owners and employees of Escazu chocolates end up doing a lot of steps by hand. For example, all of their chocolate bars are hand wrapped. Also, Parson and his partners hand select the beans that go into their bars. Time. A quality chocolate bar takes time to prepare. For example, mass produced chocolate bars often use unfermented beans. Fermented beans are more expensive and take time to prepare, but they taste better. Also, a good chocolate bar will have aged for at least 30 days. Why should you support artisan chocolate makers? Parson barely touched on the darker side of chocolate making, but as The Conscious Shopper, I happen to know that conventionally grown cocoa uses more pesticides than any other crop besides cotton. Plus, cocoa farmers struggle in extreme poverty, "generally [earning] only $30 to $100 a year," according to Green America. Many farmers choose to keep their children out of school to help on the farm, sometimes in hazardous conditions such as spraying pesticides on plants without wearing proper protective gear. Other farmers resort to slavery - child slave labor has been documented in the Ivory Coast, Nigeria, and Cameroon, where most of the world's cocoa is grown. Many artisan chocolate makers are certified fair trade and/or organic. Escazu Chocolates is not. So why do I still think they're a worthy company to support? Certification is not everything. For one thing, Escazu purchases all of their cocoa from Central and South America, the native home of the cacao plant, from which we get cocoa. One of the main reasons so many pesticides are used to grow cocoa is that we are trying to grow it in a place where it does not naturally grow: the Ivory Coast. The cocoa farms on the Ivory Coast are also the main ones charged with slavery and child labor. By focusing only on Central and South American farms, Escazu bypasses two of the main issues with conventional chocolate. Also, Escazu's main focus is on quality chocolate. They only purchase the finest beans they can find, and they pay a much higher price than the market value of fair trade certified beans. So they do not see fair trade certification as an issue for them. Do I wish Escazu was certified organic and fair trade? Yes. Definitely. But I still think they are an awesome company that produces some darn good chocolate bars. If you're interested in trying some Escazu Chocolates, you can find them at these stores across North America. I recommend the 74% Dark Chocolate with Roasted Pumpkin Seeds and Guajillo Chili. Or find a bean-to-bar chocolate maker near you. This post has made me hungry. Please excuse me while I scrounge up some chocolate. Like you, I agree that certification is not everything. For instance, my favorite farmer at the farmers market is not certified anything. But I know her. I know her kids. I know the two jobs her husband works on the side and I've even met her mother in law. When she tells me she uses no pesticides and is careful to enrich the soil with compost and cover crops, I trust her. A bean to bar chocolatier is similar, I suppose. Smaller businesses where you can get a better bead on the truth don't always need certification. @Karen - The bed and breakfast sounds wonderful. What a great memory to share! 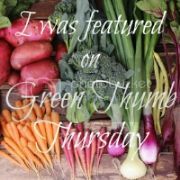 @Green Bean - Sounds like you've found a great farmer!